The F-16 Fighting Falcon is a small, multi-role fighter aircraft. It is highly maneuverable and has proven itself in air-to-air combat and air-to-surface attack. It provides a relatively low-cost, high-performance weapon system for the United States and allied nations. The F-16A first flew in December 1976. The first operational F-16A was delivered to the 388th Tactical Fighter Wing at Hill Air Force Base, Utah in January 1979. In designing the aircraft, proven reliable systems from other aircraft such as the F-15 and F-111 were selected to implement in the F-16. These systems were combined to simplify the airplane and reduce its size, purchase price, maintenance costs and weight. With a full load of internal fuel, the F-16 can withstand up to nine G's, or, nine times the force of gravity. In an air combat role, the F-16's maneuverability and combat radius surpass that of all potential threat fighter aircraft. The F-16 can locate targets in all weather conditions and detect low flying aircraft in radar ground clutter. The cockpit gives the pilot unobstructed forward and upward vision, and greatly improves vision over the side and to the rear. The pilot has superb control of the F-16 through its "fly-by-wire" system. For easy and accurate control of the aircraft during high G-force combat maneuvers, a side stick controller is used instead of the conventional center-mounted stick. 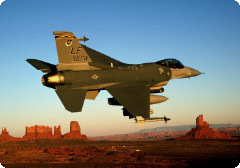 All F-16s delivered since November 1981 have built-in structural and wiring provisions and systems architecture. This improvement program led to the F-16C and F-16D aircraft, and incorporate the latest cockpit control and display technology. All active units and many Air National Guard and Air Force Reserve units have converted to the C and D models. Page rendered on 25 April 2019 at 00:17:11 in 346.899 microseconds.